Alvin Lucier's Music 109 - Your professor is prepared. Yesterday I was trying to get to a wonderful book, Music 109 by Alvin Lucier (2012), an adaptation of the music history class Lucier has been teaching at Wesleyan University for the last forty years. Lucier is, in the sense I was discussing, a conceptual composer. His compositions break music down into sound. He hooks a wire up to some electronics and lets it vibrate – that’s a composition (Music on a Long Thin Wire). In his best known work, I am sitting in a room (1969), Lucier records himself describing the piece, and then records a playback of the recording, and then records a playback of the playback, repeating until the acoustics of the room have destroyed any trace of speech aside from its rhythm. What remains, surprisingly, is music, or something very much like it (“Speech became music. It was magical”). The process of the creation of the piece is crucial to understanding what it is, to even know what I am hearing. Why would anyone record this uninteresting text, which begins with “I am sitting in a room”? The finished recording is forty-five minutes long. The distorting acoustical transitions are small and the piece moves slowly. Although Lucier also wants to hear the results of the process. He likes the surprise. I believe I have only made it all the way through I am sitting in a room three times, although I have listened to parts of it many times. I must have first come across Lucier in William Duckworth’s survey 20/20: 20 New Sounds of the 20th Century (1999), which included I am sitting in a room alongside Stravinsky’s The Rite of Spring, Ives’s Concord Sonata, and Gershwin’s Rhapsody in Blue as one of the seminal works of the century. Really? Yes, at this point, yes. Since Lucier is now part of music history, his music history class is his music history. The first work discussed is Charles Ives’s Symphony No. 4. Beethoven appears as the author of the Grosse Fuge, “the only nineteenth-century work that can exist on a wholly modern music concert” (183). The major figures are John Cage, Robert Ashley, La Monte Young – people Lucier knew and worked with. Chapter titles cover forms (Opera, String Quartets), but also concepts (Indeterminacy, Repetition) and who knows what – Bell Labs, Words, Tape Recorders. The prose is conversational, although secretly filled with pedagogical mines designed to explode years later. I should try to write more like Lucier. He gets to the point. How wonderful that with the internet a curious reader can now listen along with whatever crazy piece Lucier mentions, no matter how obscure. How wonderful Lucier’s class must be. The fiction of César Aira is conceptual. It is created under a restriction that is not part of the text itself. Aira talks about his method of composition openly in interviews, so it is no secret, but there is no way to derive the method from the text. The narrator of Varamo says that is exactly what he is doing (“all the critic has to do is translate each verse, each word, backwards, into the particle of reality from which it sprang,” 45) but he is fictional, and that line is a joke. You have to read the little tag beside the painting to know about the concept. This kind of explicitly conceptual fiction is rare and has always been rare. No need to pester me with your favorite exceptions. Conceptual theater and poetry are much more common, which is why Varamo is about the composition of a poem. The novel is set during 1923 (p. 3), so the great poetic masterpiece that is supposedly at the center of Varamo, which itself is composed in a conceptual manner (it is a found object collage), is written in the same year as The Wasteland, another collage-like masterpiece. This is not a coincidence. Within his constraints, Aira does not break so many rules. He has characters, plots, jokes, transitions, all of the usual stuff of fiction. Heck, Walter Abish has all of that stuff. See the amazing post Rise put together. Abish’s Alphabetical Africa (1974) employs an arbitrary constraint based on the alphabet. The first chapter only uses words that begin with the letter A, the second chapter expands to words that begin with A and B, and so on for 26 chapters, after which each chapter removes a letter until we shrink back down to A words at the end. As soon as you leaf through the pages you get the concept. And yet the novel still has characters (not particularly good characters, I admit), a plot, etc. I have argued that Madame Bovary belongs in this company. I am not sure many people believe me. If conceptual fiction is rare, purely conceptual fiction, or for that matter poetry or plays, barely exists. I mean novels consisting of a single word repeated ten million times, or poems without words. That kind of thing. It has never been an important part of literary history. Twentieth century fine art and music are of course full of – from the point of view of many people, plagued with – this stuff. John Cage’s 4’33”, just four minutes and thirty-three seconds of a pianist not playing the piano, or Marcel Duchamp’s signed urinal, or Yves Klein’s monochromatic blue paintings, or Yoko Ono’s string quartets, where the complete score is something like “The musicians and audience leave the concert hall and look at the stars.” I made that specific one up, but that’s what they are like. Many music lovers and art enthusiasts hate this stuff, just loathe it. They think it has ruined modern art, and that the artists are con men and the audience a pack of fools. Let’s not go into the reasons for this. Skeptical readers can comfort themselves that despite the best efforts of various Dadaists and Surrealists and Vorticists, conceptual literature has remained more of a concept than it has in music or fine art. In literature, it is fairly easy to pretend that conceptual art does not exist. This is all a preface to a kind of book review, if you can believe it. Nobody cares what I think about César Aira or his 2002 novellisimo Varamo. Nevertheless I will write something about it. No , it is all right, you do not have to pretend. Varamo is a Panamanian bureaucrat who inadvertently writes one of the great masterpieces of experimental Latin American poetry despite never having written poetry before. Varamo is the account of how he did it, “an experiment in literary criticism” (44) that otherwise resembles Surrealist fiction. The story covers one eventful night as Varamo – but what matters with Aira is not what happens but The Method, the deployment of the Aira Conceptual Apparatus, through which Aira is not allowed to revise previously written work. Each day he confronts himself with the previous day’s exquisite corpse and must somehow move on with it, which perhaps seems easy enough except that he deliberately sets bizarre traps for his future self, inserting nonsensical plot twists and ludicrous digressions in order to keep himself interested. Or to keep me interested (“Not to mention the risk of boring the reader,” 44). “[O]n the other hand, the reality effect is lost, as it always is when an automatic mechanism intervenes” (46). Please note that this is, with minor modifications, also the method of Wuthering Expectations. Varamo is actually about The Method. Or about creativity. Thus the business about the piano-playing fish – the incipient poet’s first creative hobby is taxidermy. Then there are stories (“For Varamo, this story was a sort of metaphor or fable,” 35), codes, hallucinations, counterfeiting. Near the end Varamo bumps into a couple of publishers – if that ain’t a tipoff. They fill him in on the history of Latin American publishing. “Faced with the alternative between becoming translators or alcoholic bums, some at least favored the first option” (76) – Aira is himself a translator. If one tried to make a list of [Calvino’s] values from this collection of letters, it would include the cosmic, the frame, the refusal of the personal, the love of small forms, the fantastic, the metafictional, or self-consciously fictional. And all these values are on either side of the human scale: either too small or too large. Varamo is the seventh Aira text I have read, out of eighty or ninety that he has written, so what do I know, but that is pretty close to Aira’s list. Which is what the reader who gets to these last lines just did. The review at Tony’s Reading List inspired me to read Varamo. Chris Andrews translated this one. A hazard of being interested in books is that I pay too much attention to the books within books. I admit that. But there is a contrast of books in The Last Chronicle of Barset that is appealing. with the exception of the small space at which he wrote, was covered with dog's-eared books, from nearly all of which the covers had disappeared. There were there two odd volumes of Euripides, a Greek Testament, an Odyssey, a duodecimo Pindar, and a miniature Anacreon. There was half a Horace – the two first books of the Odes at the beginning, and the De Arte Poetica at the end having disappeared. There was a little bit of a volume of Cicero, and there were Cæsar's Commentaries, in two volumes, so stoutly bound that they had defied the combined ill-usage of time and the Crawley family. All these were piled upon the secretary, with many others – odd volumes of sermons and the like; but the Greek and Latin lay at the top, and showed signs of most frequent use. I wonder if I am supposed to take these books as simply representative of Crawley’s love of literature or if they are meant to be individually meaningful. For example, is the lead position of the willfully perverse Euripides meant to be a comment on Crawley’s personality, or would Aeschylus or Sophocles do as well? The fact that the Bible is second in the list, that is pretty easy to see as symbolic. Crawley's only moments of happiness through most of the book, and there are hardly any, all involve either 1) defeating an enemy, or 2) reciting Greek poetry. His ministry is his vocation; poetry is his love. That Horace, where Crawley only has half – the middle half – that’s the way to read a great book. How often do I read like that? Almost never. Auerbach’s main purpose in this chapter is to describe the strange way Chrétien’s fictional world of knightly adventures includes nothing unrelated to the adventures themselves, nothing in the landscape or society. The purpose of a knight is to go on adventures; the purpose of adventures is to create knights. This is all completely contrary to the technique of Trollope; almost contrary to the form of the modern novel. Except it is clear, if I adjust my lens a bit, that Trollope tests and develops his young gentlemen by sending them on perilous adventures. Johnny Eames, in The Small House at Allington, defeats a fierce beast and in the service of a lady wins a joust with a more powerful knight. In The Last Chronicle, Eames goes on a long quest, escapes the clutches of a Morgan le Fay sort of woman, and nearly jousts with Major Grantly, the novel’s romantic lead. He is even on horseback in that scene, with the Major in a gig. It is all a misunderstanding. I am talking about Chapter 27, “A Hero at Home.” I am not making this up. Major Grantly’s knightly duty is actually borrowed from the courtly love period, a bit later than Chrétien. He must sacrifice (some of) his wealth and happiness to protect a lady from disgrace – I mentioned this plot yesterday. He is perhaps less of a knight and more of a perfect courtier, doing the most honorable if not necessarily most wise action possible. It would be possible to work through this exercise with other characters and in other novels (in Orley Farm and Framley Parsonage, at least). The great tension is that Trollope simultaneously believes in the value of courage, honor, etc. exhibited by his heroes but simultaneously intuits Auerbach’s notion that this particular configuration of these ideals were developed hundreds of years ago for a class that no longer exists. Similarly, one could map the behavior of Trollope’s women onto feminine ideals of courtly love, although I do not detect the same anxiety – look at a character like the nouveau riche yet genteel Miss Dunstable who is ideally adept at casting aside social constraint when necessary. Perhaps he trusts the women more. As a knightly gentlemen, that is his duty. Two important characters are built from a different ideology. Curiously it, too, is a medieval survival. Reverend Harding, introduced in The Warden and appearing throughout the series, and Reverend Crawley, center of The Last Chronicle, are modeled after saints. Crawley, accused of a crime, fearing for his sanity, at one point fantasizes that “[a] sentence of penal servitude for life, without any trial, would be of all things the most desirable” (Ch. 62). Crawley is, metaphorically, a flagellant. An earlier passage, where Crawley compares his sufferings to those of a stylite hermit, is almost shocking – these are the thoughts of an Anglican priest? Crawley is a great sinner, as this passage shows, a proud man aspiring to sainthood, while Harding is a saint of the meek and mild, good and kind species. They are both gentlemen, too, just like the cavaliers John Eames and Major Grantly, but an alternative type, perhaps also becoming obsolete. The Gentleman in the Novels of Anthony Trollope – this is a topic I have bounced against before. Trollope is a man of his time, yet he is highly critical of gentlemanliness. His most substantive doubts are about whether gentlemanliness is becoming obsolete because of social changes. Anxiety is what I called it. Trollope is just as interested in the role and behavior of women but seems less anxious. I don’t know. So in Doctor Thorne the son of an estate owner is threatened with working for a living, and in Framley Parsonage a clergyman falls in with a fast set and gets into financial trouble because he does not have enough to do at work. Everything falls out so the men do not have to do anything too onerous. The characters are granted happy endings, but Trollope plants doubts that encourage me to imagine more satisfying alternatives. Maybe that clergyman and estate owner should not just become better people (which they do, credibly) but should also do more. The protagonist of The Last Chronicle of Barset, Reverend Crawley, does too much. He manages his parish, comforts the sick, and spends his day with the brickmakers. And where those earlier characters faced the threat of becoming – not poor – no longer rich, Reverend Crawley is poor, “now, just as he was approaching his fiftieth year, a perpetual curate, with an income of one hundred and thirty pounds per annum – and a family” (Ch. 1) Take that times forty for inflation to get £5,200 in today’s money, then double it to get $10,400, so poor for a gentleman, not for an agricultural laborer or brickmaker. Trollope even takes the trouble to present a household budget: £40/year for meat, £25/year for bread, and at least “ten pounds a year a head” for “[c]lothes for five persons, of whom one must at any rate wear the raiment of a gentleman” (Ch. 4). Crawley has one coat suitable for visiting his bishop, ragged, but sufficient to serve as a gentleman’s uniform. His wife and daughters have no such clothes, so they cannot visit the homes of gentlefolk. One of the daughters is actually the romantic heroine of the novel who needs to move from place to place. Her friends give her the necessary clothes. Much is also made of a gentleman’s access to a horse, which Crawley of course does not have. When the bishop summons him to Barchester, he walks (mostly), and enters the palace with mud on his shoes. The main plot of the novel is that Crawley is accused of stealing £20 (say $1,600). Would a clergyman do such a thing – that is a common question, but just as common: would a gentleman? Because by birth, position and education, Crawley is a gentleman. The parallel plot is that the daughter cannot marry the man she loves (“She feels that, with this charge hanging over her father, she is not in a position to become the wife of any gentleman,” Ch. 33). Or, really, should not, but these Barchester heroines always behave well (no anxiety), so the question is how the gentleman in question behaves. It turns out that he also behaves well: he proposes in spite of or perhaps even because of her disgrace, and in the face of a risk of being cut off by his family, moving from rich to not so rich (so Trollope is including that device, too); she refuses him, to spare him and his family the disgrace. Both heroically sacrifice themselves. What is supposed to be going on here? Why is this interesting? I believe I am almost to my one insight about this novel. I think I have no more than one real point to make about The Last Chronicle of Barset, but I am going to back into it, so to speak. Trollope never seems to be in any hurry. Trollope is not much of a descriptive writer. There are some nicely meaningful pieces of furniture in Last Chronicle, and some choice clothes, but he mostly provides some kind of type and abandons anything more specific. Are we in the house of a rich or poor person? Now furnish accordingly. The exceptions, the areas where Trollope is careful and precise, are place and time. Some of the places are invented, some, mostly London and its neighborhoods, are real, but Trollope is always clear about position. How long does it take to get from Barchester to London by train? Barchester is invented, yet the trains run on fixed schedules. Now that you are in Barchester, what is the way to Hogglestock, and what do you pass on the way (you pass Framley, setting of Barchester novel #4). Time is handled with similar crispness, sometimes even following the pace of the novel’s serialization. As usual, I do not believe the context matters much. The “he” is the novel’s main protagonist, Reverend Josiah Crawley, who because of his uncompromising principles has fallen into some legal trouble – this is the primary story in the novel – and is, against his principles, about to consult with a London attorney. Forget all that. What caught my attention was the parenthetical, which belongs to the omniscient narrator, who I will call Trollope. The narrator is doing his ordinary novelistic job of scene-setting when his own use of an adjective distracts him. It distracted me, too, even before I got to the dash. “Shadowy,” right? Or maybe “shady” is closer, and note thesecond definition, “inclined to take offense easily,” which accurately describes Josiah Crawley. So there is a double meaning, presumably why Trollope did not just write “shady.” But this is my digression, not Trollope’s. Trollope mentions the shade, which makes him think of the trees that provide it. However little descriptive detail he provides for me (the place name, shade, and clock are pretty much it), Trollope is imagining the sidewalk as he has seen it with his own squinty eyes. Now the strange part – he is suddenly struck with doubt, mid-sentence. Maybe the trees are gone. Why would the trees be gone? Some trees seem to be there now (although Crawley is on the street, a little way to the west, not in the park). Trollope is slipping in a little example of the great anxiety of the novel, of several of the Barchester novels, that everything is changing too quickly. Nothing in London is guaranteed, nothing anywhere. I go away for just a few days and can’t write a dang – wait, here I go. Never mind. Perhaps the problem is actually that I want to write a bit about Anthony Trollope’s The Last Chronicle of Barset (1866-7), an accurately titled novel, and therefore a book unlikely to inspire original thought, even by the standards of Wuthering Expectations. It is a lot like the first five Barchester books, except longer, and the last one. Except it is in some ways not like the other five. It is, for example, not full of comments about itself, not a novel about the conventions of a novel. Barchester Towers, the second book in the series, has so much text about How Fiction Works that it sometimes feels like a sequel to Tom Jones. The amount and type of meta-ness varies from novel to novel, but in The Last Chronicle it is finally gone. Trollope either 1) got tired of it, 2) suppressed it, 3) had no room for it, or 4) ran out of jokes. The book is so stuffed with story and characters that my guess is 3), although I have suspicions about 4). Last Chronicle contains a sequel to Barchester book #2 (itself close to a sequel to #1), a sequel to book #5, as well as a new novel centered on a minor character from #4, not the one many readers would have guessed, that by itself would have filled an ordinary three volume novel. A grid of the characters, chapter by chapter, would be useful. I will have to read the novel again to know if there is any logic to the movement from subplot to subplot. I presume there is. The novel is Trollope’s experiment with weekly serialization, so it even more repetitious than usual, since for the original readers it could take three or four installments to return to a character. “Who was the major’s aunt Eleanor?” a character thinks late in the novel, in Chapter 74, standing in for the readers who have not been keeping up. Eleanor is from way back in the first book, from The Warden. Trollope has to write a number of variations on this sentence. No, that is an exception, a weak joke a bit beneath Trollope, honestly. What I mean is that even the title declares that this is a book that depends on other books, a book with a particular shape and purpose. Unresolved plots may well resolve, characters who have survived this far will be allowed to die. Almost every major character is pushed back on stage, almost every country house is revisited, but for the last time, the title says. Say your farewells. Read this book differently. Anyway, Trollope is a perpetual motion machine. The first of the six Palliser books was published in 1864, years earlier, and Palliser #2, Phineas Finn, gets going in just a few months. The Last Chronicle of Trollope is something like 27 novels in the future. Maybe I have another thing or two to write about this book. I had a second literary encounter in Husum, a surprise, one that reinforces a common Wuthering Expectations theme. An attractive brick high school from the 19th century has been turned into a luxury hotel, the Altes Gymnasium Hotel. One night we went to the hotel restaurant, the Gourmetrestaurant Eucken. The restaurant is so fancy that its menu is just two pages. One page is the Menu “Theodor Storm,” of course, what else, and the other is the Menu “Rudolf Eucken.” The menu is, for now, here as a PDF – perhaps you can guess what I ordered. Who is Rudolf Eucken? The menu had a biography. He was a philosopher who had taught in this very high school in Husum for several years, before receiving prestigious university appointments in Basel and later Jena. He eventually won the 1908 Nobel Prize for Literature. Really? No kidding? Who? (I am pretending I am in the restaurant, struggling with the biography, asking meine Frau if I had made some mistake with the German). I have at least glanced at the list of Literature Prize winners several times, but Eucken’s name meant nothing to me. He was recognized for “his earnest search for truth, his penetrating power of thought, his wide range of vision, and the warmth and strength in presentation with which in his numerous works he has vindicated and developed an idealistic philosophy of life,” which could hardly be more generic except for the last clause, which matches Alfred Nobel’s original “idealistic” conception of the prize. Naturalism cannot give to literature an inner independence or allow it an initiative of its own; for if literature is only a hand of life on the dial of time, it can only imitate and register events as they happen. By means of impressive descriptions [Zola, right?] it may help the time to understand its own desires better; but since creative power is denied to it, it cannot contribute to the inner liberation and elevation of man. At the same time it necessarily lacks dramatic power, which cannot exist without the possibility of an inner change and elevation. Literature should instead “help to shape life and to lead the time, by representing and simultaneously guiding what is rising in man's soul” and thereby “raise our life to greatness above the hubbub of everyday life by the representation of eternal truths.” No wonder, given this guff, so many contemporary writers were trying to burn literature down and start over. All hail King Ubu! I do not really know why Eucken’s name meant nothing to me. Despite his Prize, he got left behind somehow. Checking library catalogs, his books have not appeared in English since 1924 (The problem of human life as viewed by the great thinkers from Plato to the present time). The Harvard University library catalog shows a few recent hits, books tagged with his name, three in the last ten years, including a twelve volume set of his collected works. So he is not a forgotten writer, not quite. There are some limits on how much a Nobel Prize can do for a writer. The lobster soup made in his name was good. I guess I am going to run off for a couple more days. Back Monday with some Trollope, maybe. It is just a small ordinary town, my birthplace, set on a flat treeless coastal plain, and its houses are old and grey. The town is Husum, on the North Sea coast of Schleswig-Holstein, home of Theodor Storm and inspiration for much of his fiction. It is now, because of Storm, much less ordinary. Also, the houses have been painted. It is quite pretty. I was just there. I spent more time there than in Lübeck, Thomas Mann’s birthplace. By a coincidence of lodging I passed by Storm’s grave several times a day. It is in the cemetery attached to St. George’s Hospital, which is featured in Storm’s 1868 story titled, in Denis Jackson’s translation, The Swallows of St. George’s; the title quotation is from page 97, and more quotations can be read in this old post about beauty. Never before have I been in a place so suffused in a writer’s work. The reverse is not true – other writers have plunged into their landscape. But they rarely have so many plaques to show for their effort. Here is the old rifle club featured in Paul the Puppeteer; this is the house from Aquis Submersis, while the one from Carsten the Trustee is across the square. 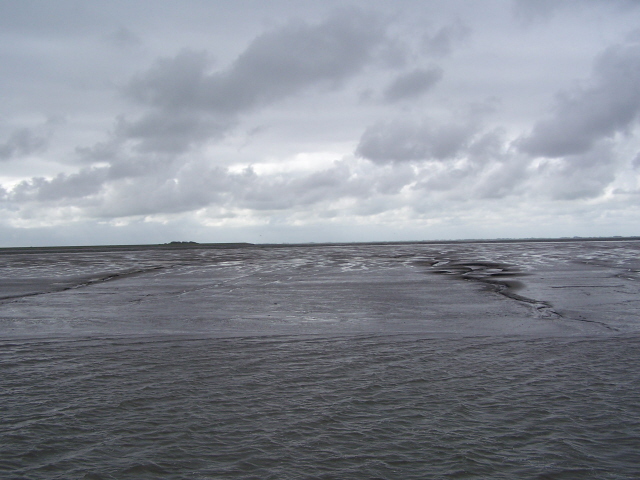 The poem gives Husum its nickname, the “grey town by the sea,” although the town is no longer grey, honestly. Those mudflats are, admittedly, extremely grey. The tidal flats are now part of an enormous marine national park, home of seals and gulls and worms and a handful of hardy maniacs who live on the halligen, the tiny, flat, undyked islands that presented an uncanny aspect, the large farm buildings appearing to float on the sea. 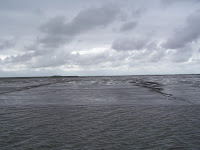 The narrator of Storm’s “Journey to a Hallig” visits Süderoog Hallig, inhabited by his cousin and some sheep, much as it is today judging from the satellite view. It is a paradox of landscape writing, that it can be so well described as to be instantly recognizable, yet almost impossible to imagine correctly without seeing it. 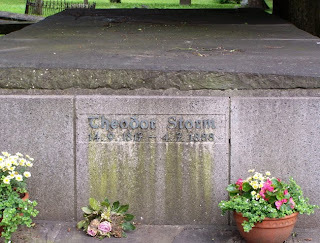 The Theodor Storm House and Museum was not particularly enlightening, but only because I had already read so much about Storm in Denis Jackson’s thorough notes and introductions, and on his magnificent website devoted to Storm. I would not recommend a trip to Husum to a party depending solely on English. Danish might work, but not English. The aspects of the novel I have found the most impressive are the tedious bourgeois stuff, while I am skeptical about the decline stuff, which does not seem to support as much meaning as its author would like. Thomas Mann thought he prefigured Max Weber, but I am not so sure that treating Buddenbrooks as a work of sociology does it a lot of good. Mann disagrees. Mann and I always seem to disagree. The tedious, bourgeois stuff is what I think of as the Flaubert-like side of the novel – the parties and wallpaper. Mann talked more in terms of Richard Wagner and leitmotifs. I would love to read about some examples. Perhaps I missed them. Mann’s leitmotif method, as I see it, is a mechanical repetition of detail, more John Williams than Wagner, with the Darth Vader theme playing whenever the character appears. So to speak. It all appears to be much less intricate and sophisticated than the subtle patterns created by Flaubert, Joyce and Nabokov, but of course these patterns are almost entirely invisible on a first read of Madame Bovary or Pnin, and here I am complaining that I do not see them after one pass through Buddenbrooks. Well, obviously. Related is the mystery of Mann’s irony. Mann is routinely described as being particularly, even uniquely ironic, but I am having trouble distinguishing his irony from that of, say, Anthony Trollope, another incessantly ironic writer who is given less credit for his stance. So for example, Thomas Buddenbrooks would like to have more heirs, but only has one son who is unsuited to business. Long ago, he had a fling with a girl who works in a flower shop before he married someone of the proper status. The flower girl, over time, has many healthy children. This is, in a sense, ironic, and is perfectly good novel writing, but I do not see how it is so unique to Thomas Mann. I have wondered if Mann’s irony is the same thing as his detachment, admirably accomplished for a story so rooted in his own biography, but now we are back to Flaubert, who is similarly detached. The post’s title can be found on p. 693, Part Eleven, Chapter 2, the longest chapter in the novel, Hanno’s school day, “one day in the life of little Johann,” as the chapter’s last line says. At times reading Buddenbrooks, I sympathized with Hanno, although he is referring to Ovid in Latin. The next line, beginning the next chapter, is “Typhoid runs the following course:” followed by a detailed, clinical description of the symptoms of the disease, three full pages of dismaying, repulsive symptoms with no reference to any of the novel’s characters aside from a doctor, the tone different from anything else in the novel, but in some ways resembling the surprising end of The Sorrows of Young Werther, where the one-sided epistolary novel transforms into a coroner’s report. I suppose it is not all gibberish. I have a full agenda for the next time I read Thomas Mann. The family saga is such a common form now that I at first did not notice how unusual Buddenbrooks was. If Thomas Mann did not invent the genre, I suspect that he came upon it independently, since it is not likely that he had read Wuthering Heights or the most underrated English novel of the 19th century, John Galt’s The Entail, both of which contain central characters obsessed with the continuity of the family firm (real estate holdings) and sons incapable of running the business. Perhaps Mann borrowed the idea from Richard Wagner’s Ring of the Nibelungen operas, which he insisted were the source of his treatment of detail, or from Icelandic sagas, but if so he made an admirable leap of imagination squashing that stuff into a realistic novel. Now the form is everywhere, in William Faulkner and James Michener, The Godfather films and the Dallas television series. Buddenbrooks became a long-term bestseller. It is strange to think that it is at the beginning of a chain leading to Mario Puzo and J. R. Ewing. My understanding is that Mann’s ideas (not his writing) worked backwards – that he first envisioned a short novel about young, creative Hanno, the end of the family line, but then decided that he needed to show where Hanno came from, leading back to parents and grandparents. How Mann knew where to stop, I do not know. A strange result of this process is that much of the book is barely related to Hanno at all, but instead branches off from the main story: the education, love affairs, and three marriages of his Aunt Tony. I will bet that Tony’s story has more to do with making the book genuinely popular than anything else in it. She sacrifices a chance for true love out of loyalty to her family (and as the result of bullying from her father). This part of her story sometimes reads like an ironic commentary on Theodor Fontane’s Effi Briest (1895). She has terrible luck with husbands. Almost absurdly bad luck. Her “third marriage” is actually her daughter’s marriage, and again, she and her daughter have grotesquely bad luck. Perhaps the relevant model is Greek tragedy, with the gods conspiring against her, except that Tony’s fate is not really tragic. She is too resilient, too much fun. It is a shame when the claims of other characters relegate her to the background in the last third of the novel. It would make sense to describe Tony, but I will instead close with the man who becomes her second husband, Alois Permaneder, vulgar, obese – Mann is curiously obsessed with obesity – and most importantly, Bavarian. Since he is a southerner, the translator transfers his thick Bavarian accent to the American South, to Savannah, say, or Nashville (“’You got another kind of gittup ‘n’ go up this way, damn if y’ don’t,’” 325). His accoutrements, though, stay in Germany, his cane which is “topped by a curved, clawlike handle of deerhorn that measured a good foot and a half” and his “gold watch chain with an entire bouquet of charms, a glittering collection of silver, coral, bone, and deerhorn trinkets” (320). It is as if a fat Davy Crockett comes to court Tony. I do not really think of Thomas Mann as a comic novelist, but Permaneder had me laughing. Perhaps this gives an idea about Tony’s character, too. Why does she “daintily filet his herring for him” (324); what unfortunate combination of strengths and weaknesses of character lead her to marry this fool? What is Buddenbrooks? In Erich Auerbach’s description, it is “the first great realistic novel [in German, he means], which, despite its complete originality, corresponds in its level of style to the works of the French nineteenth-century realists” (Mimesis, 1946, tr. Willard Trask, pp. 517-8). I wish more reviewers summarized books like this. It is what I want to know about a book. Nevertheless, from here on out I will indulge in a little more plot detail than usual, so potential Buddenbrooks readers of a delicate temperament will want to avert their gaze. Buddenbrooks is all about temperament. The Buddenbrooks family owes its fortune in the Napoleonic Wars, a good time for provisioners, twenty or thirty years before the novel begins. Thus the peak in fortune in the first long scene; thus the decline. The opportunities of war do not come along every day, and when they do, as in 1865 or 1870, the head of the firm is too risk averse, or, ironically, too committed to the reputation of the firm to prosper from them. Almost all of the most important characters in the novel – a novel with hundreds of named minor characters – are present at the first party. I mean the three children, the Buddenbrooks siblings, Thomas, who will take over the firm, Christian, who will flounder about, and Antonie, who will – well, her story is complicated. The only character of similar importance is Hanno, Thomas’s son, off in the future, the boy with musical talent, bad teeth, and bad grades. There is a fourth sibling, Clara, whose role is minor. The four siblings between them produce two (or just possibly three) offspring and a single grandchild among them. Here is the source of decline – this is a demographically unusual result for well to do Germans of their time. They have bad luck with their marriages, and with their health. I was expecting something more along the lines of a tragic flaw to appear in the Buddenbrooks family, or some sort of original sin, something more Shakespearian, or Sophoclean, or Faulknerian, but Mann is after something else. After all, both he and his brother were children of artistic temperament who had no interest in taking over the old Mann merchant firm, causing their father to dissolve it upon his death. What looks like a decline from one point of view is anything but from Thomas Mann’s. Then the question is how, without much of a sense of doom and tragedy, a writer can find any dramatic interest in this material. So that is the task for the next couple of days. That’s a funny way to start a novel, isn’t it, as Thomas Mann starts his first novel, the long family saga Buddenbrooks: The Decline of a Family (1901). The dashes and ellipses are Mann’s; the page number refers to the 1994 Everyman’s Library edition, the John E. Woods translation. Grandpa Johann finds the child’s claim to fields and cattle so funny because he is a grain merchant, the Buddenbrooks one of the great merchant families of Lübeck, where I spent several days on my recent vacation. As a little joke, Mann never mentions the name of the city, although it is clearly recognizable and he does mention specific streets, churches, and neighboring towns. He does the same thing in the 1903 novella Tonio Kröger, which is a kind of theme and variations on the last part of Buddenbrooks. I now see that Mann wants that line of the catechism because it describes so much of what he puts into the novel. The opening chapters, for example, describe a housewarming party, celebrating the families purchase of a mansion worthy of their status, thus giving Mann a long scene to describe food and furniture, clothes and faces, family and neighbors, just the sort of scene used to such good effect by writers like Flaubert and Eça de Queirós. It is not the entire novel in one long scene, but it contains a lot. I should look for a pair of those at the thrift shop. Also for “the splendid inkwell – a black-spotted hunting dog of Sèvres Porcelain – that graced the secretary” (I.2., 11). The “colossal smoked ham, brick-red and strewn with bread crumbs” (I.5., 23) and the raspberry pudding, “a layered mixture of macaroons, raspberries, ladyfingers, and custard” (I.6., 28) I can make for myself. I have already described, in a post on Mann’s contemporary regionalist Sarah Orne Jewett, the landscape room, with its amazing and perhaps oppressive combination of painting, fabric, sculpture, and furniture, a Baroque survival that I now know was a standard component of Lübeck mansions of the time – please visit the Museum Behnhaus Drägerhaus for several examples. The Buddenbrookhaus, which holds Thomas and Heinrich Mann archives and exhibits, also contains a reconstructed version of the landscape room and other rooms from the book, all inventions. Buddenbrooks is fictional. But it is thickly described.